What will the gardens of 2024 be like? We envision the gardens of the future as places where leisure meets productivity. They will help us connect to nature in a time when nearly half of the world population will live in cities. Next gardens is a collection of solutions to make the gardens of the future smarter, more productive and enjoyable. New technologies translate what the garden feels and needs to a language that we can understand. 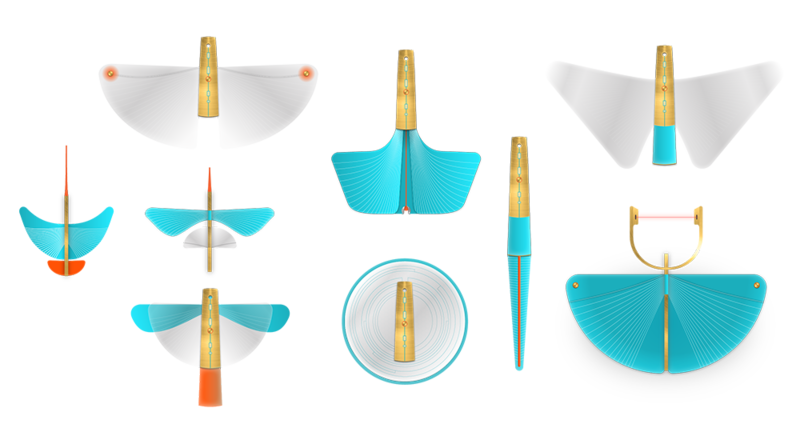 Drones designed in collaboration with Marlies Kolodziey. To make our vision more tangible we created a video that shows how the drones interact with the garden and what kind of information and tasks they can collect/perform. A productive garden of delights. 9 different drones monitor the garden by collecting information from plants, water, soil and air or by playing an active role in pollinating, cutting dead leafs or even collecting pigments and fragrances. Getting to know your plants needs and getting the most from them. Next gardens make it easy to understand when your plants need to be watered, when to will they blossom or when the to expect ripe fruit. The drones are a combination of the best of nature and technology. From far they look like part of your garden because the way they look and behave fits their surroundings. Gardena Dock designed by Onno Adriaanse, Gardena Soil designed by Anne Stroom.